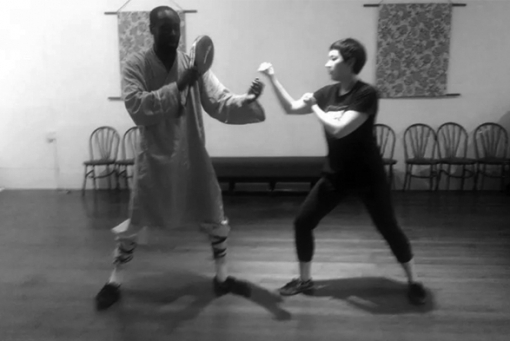 Picture taken at the Shaolin Luohan Institute in Oakland, CA. Thumbs are tucked. Palms make a shallow well as if to offer feed to a nearby bird. The hand makes an obtuse angle, the fingers aim directly underneath the jaw, to strike and pull back again, like a snake’s head. It’s Daylight Savings Time. After class, I walk to my car with my keys clutched in my hand, into the early dark, toothless and running a thumb across their serrations. The more I learn about fighting, the more willing I am to run. When doing forms in the mirror, I’m reluctant to make eye contact with my own reflection. The shape of a fist, a real fist, feels unfamiliar. I’m told these stances ground me. Help me find my strongest posture. Center my chi. I can barely do ten pushups. The Shaolin monks used to meditate in mountained temples, seeking enlightenment, sitting in one place for hours a day, waiting for the feeling. I don’t know the feeling. I don’t actively seek the feeling. Enlightenment is a $1.50 taco from the taco truck at 8 PM. I leave Oakland for Montana in six months, and every passing week, I feel the Rockies rising to meet me, and the tide to the West receding. I plan my last burrito. Last Korean barbeque. Last mango sticky rice. It feels wrong to plan for these when I wake up every morning feeling there is so much to do, and that I don’t do enough, and it kills me. In the monasteries, many of the monks never felt enlightened. Or maybe they caught glimpses of it, but couldn’t draw it back. As they tried, the knit kept unraveling. Their muscles became stiff and their bodies atrophied. They died at nineteen, twenty years old. Nobody knew the importance of bodies. Were you supposed to transcend your body or did your body, itself, become a temple? What is the feeling I’m supposed to feel? I sing K-pop songs without knowing the words. I read books I don’t understand. I can’t count to ten in Chinese. I’m finally learning to take pride in myself, and I’m being whisked away to a winter white wonderland where nobody gets me like that. “What are you gonna do?” my auntie asks. “You gonna write, or you gonna march?” A writer and activist who marched with the Farmworkers Union, she taught me isang bagsak when I was younger, a Filipino unity clap she learned in the 80s during the People Power Movement. I did it with her, but never took it outside. Who would clap with me? Now she lives in Culver City doing juice cleanses. Sparring step number eight: I step my left leg behind my right and wind up my torso. I fling my right leg up and give a small tap with my heel. It’s supposed to aim for the groin. It only needs to be a tap. “That’s the feeling!” my teacher says. I do it again and try to remember the feeling. The tension in my midsection, the angle of my leg as it springs up. I try to replay it, get used to it, dream about it. I don’t feel it clearly anymore. It feels like blinking during a camera flash and only seeing spots. I leave class in the dark. Three young men are down the street, toking by a doorway. “Hey baby,” one says, generically. I turn to respond, but my mouth won’t open. I turn back and keep walking. “She had to look at you to know she didn’t want you,” another says. He’s laughing as I pass underneath the street lamp. When Bodhidharma invented kung-fu, it was to keep the monks from dying. Horrified by the state of their health, he felt moved to share what he knew. The movements were designed to be precise, thoughtful, and meditative, so the monks could still focus. Their muscles grew. They became stronger, they stood taller. Later, they observed earthly conflicts and saw themselves as participants. Some were glad of this, to be healthy, to live longer, to know enough to defend themselves during wartime. Others were just glad for their extended shot at enlightenment. They didn’t want to answer the hundreds of questions that come with participation. “What if I can’t learn everything before I leave?” It’s a Sunday before class. I watch joggers stretching under the columns by the lake and can smell someone nearby smoking brisket. I didn’t mean everything everything. Just everything up to the next level. But I don’t say that. Friends make jokes about how I can beat them up now. I play along, thinking of moments, while sparring, I inwardly said uncle a dozen times. I take BART home. Sinking into my seat, I notice a sign near the window reading: “For security matters call BART Police.” Underneath, someone had scribbled the name “Oscar Grant.” The things that make me angry under my skin also paralyze me. I’m a participant with no idea how to participate. I can imagine myself scribbling that name like a hieroglyph, in impotent passive aggression, knowing only to express myself through words and signs, but never movement. What do I do to keep from dying? I get eight hours of sleep a night, eat lean protein and vegetables. I find one thing to like about each new person I meet. I choose mentors. I refuse to weigh myself because a number that can only get lower encourages confusing disappearance with results, when really I don’t want to disappear. I want to be enormous with courage. I need to put myself in more situations that make me feel small, but I want to be the ten-car train that goes screaming into the tunnel. Choosing between these feelings, I choose to feel nervous, anxious, new, and come out brave, laughing, and savvy. I count my arm bruises in the mornings now. I showed them off to a boy who looked concerned and tried to kiss them, and I just laughed, pulling my arm away. Surely, if I can rock the coastline, I can brave the stars. It takes work to disappear, almost as much as it does to do the opposite. Five stops left to MacArthur, I imagine dipping my feet in the basin of a tide pool, and try not to think about how long it will be before I hear an ocean. Ari Laurel is a writer out of Oakland, CA, pursuing an MFA in fiction writing at the University of Montana. She blogs about media and activism at Be Young & Shut Up. Follow her at @ari_laurel.